January 2017 – Creo en Dios! Pope Francis’ statement, quoted in the title of this post, seems a pretty obvious one. Pointing out that the sin Jesus had the greatest condemnation for is hypocrisy, the Pops expressed clearly and directly that being a Christian requires living in the Beatitudes and taking seriously the judgement passage in Matthew 25. One can argue for strict vetting of refugees (something we already do) and there is surely an outside limit on how many refugees a country can absorb (a limit the United States is nowhere near approaching), but I do not see how a Christian can defend an indefinite ban on refugees from Syria. I do not see how one can participate in a March for Life and then condemn people to misery and death. Yes, I have heard the vague assertions that this is for the protection of America. The same assertions that caused the United States to turn away Jews during World War II (“they might be Nazi spys”), making it complicit in the holocaust. The same assertions that led it to intern Japanese-Americans, in my view one of the great blights in American history. Some Christian leaders are already denouncing Friday’s executive order. I pray others do the same. Today, January 27, is Holocaust Remembrance Day. 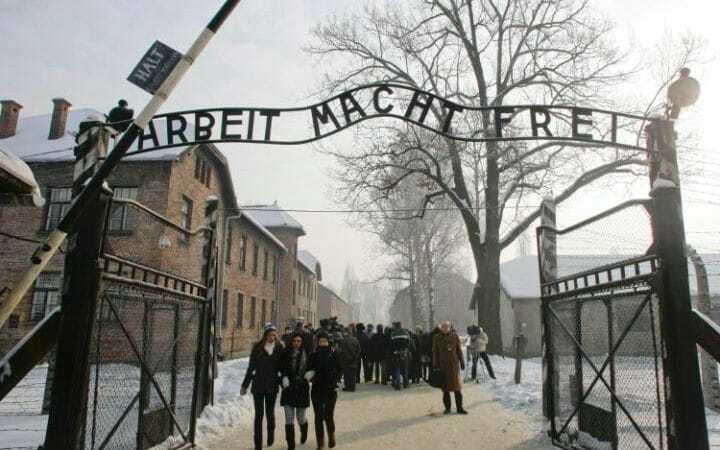 Seventy-two years ago on this day the Soviet army liberated Auschwitz. Many survivors of the camp will visit there, lighting candles and praying, or otherwise paying homage to those executed by the Nazis. Today is a challenge to all of us to learn from the past. To learn where racism and hatred inevitably lead if left unchecked. Yesterday (Wednesday) I gave a retreat day for the University of St. Thomas’ Selim Center for Learning in the Later Years on the theme Discerning My Place in the Second Half of Life. There were about 45-50 men and women in attendance, ranging in age from 47 to 99 years old. The simple truth is that aging is not optional. We all age and we all will die. We can color our hair, we can use cream the promises to iron out wrinkles, we can (and should) exercise and eat well, but none of that stops the aging process. I think of the latter as aging optimally, a phrase I took from an 86 year old woman religious I once directed on a summer retreat; she had been nominated for an award for “aging optimally” by her local community. Living into one’s eighties, nineties, and even past one hundred is a real possibility today, one that makes fifties and sixties a time not for winding down but for gearing up. We need to look afresh at this prospect of a longer life and ask ourselves, What’s the best use of this extra gift of time? To be sure, the discernment we do in the second half of life is different from discernment at earlier stages. We are asking different questions and we are addressing those questions from a very different standpoint. Identifying patterns of thought or behavior that we need to face and change. Identifying deep and lasting wounds and learning how to seek healing and restoration. Choosing the best out of multiple good options. Dealing with unhealthy attachments; praying and working toward spiritual freedom. One of the points I made yesterday was that, apart from any specific questions that arise, the second half of life is the time to ask ourselves what do I want or need to do with the rest of my life, with the time I have remaining? What do I need to do before I die? Dennis Linn suggests that the sooner we ask the question, “What do I need to do before I die?”, the more meaning our remaining life will have. As an example of the fact that some people may need to live in some new way before they can peacefully accept coming to the end of their life, I mentioned Alfred Nobel. Nobel, a Swedish chemist, made his fortune inventing dynamite and explosives. When his brother died, a newspaper accidentally printed Alfred’s obituary. Most of us don’t get to read our own obituary in our lifetime. For Alfred it was eye-opening to read that he was remembered for making a fortune by enabling armies to achieve new levels of mass destruction. That was not how he wanted to be remembered and so he determined to change his life. And of course today we remember Alfred Nobel because he used his fortune to found the Nobel Prize, which annually rewards the research that most benefits humanity. So, whatever your age, I would invite you to spend some time asking yourself: what do you need to do that has been left undone. Do you need to tell your story to someone? Do you need to say something particular to someone? Do you need to do some particular thing? Is there something you need to give away? Today the Catholic Church celebrates the memorial of St. Francis de Sales, bishop, writer and spiritual director. Francis believed that “holiness is perfectly possible in every state and condition of life,” and his writings are of wonderful benefit to all of us, especially for lay people. We should not want to practice many exercises at the same time and all of a sudden. The enemy often tries to make us attempt and start many projects so that we will be overwhelmed with too many tasks, and therefore achieve nothing and leave everything unfinished. Sometimes he even suggests the wish to undertake some excellent work that he foresees we will never accomplish. This is to distract us from the prosecution of soem less excellent work that we would have easily completed. This is important advice to keep in mind. It is so easy to give in to the temptation to take on too many things when they all seem worthwhile and good. But we know from experience that it is possible to take on so many different projects that one is overwhelmed and almost incapacitated from getting any of them done. This is precisely the goal of what Francis calls the “enemy” (what Ignatius would call the “evil spirit”). For those unfamiliar with Francis’ writings, I would suggest reading his Finding God’s Will for You and his Introduction to the Devout Life. As part of its “Salt and Light” speaker series, the Church of Our Lady of Lourdes today (the 44th anniversary of the Supreme Court’s decision in Roe vs. Wade) featured parishioner Victoria Johnson, who spoke about abortion. Victoria shared from her own experience of having had an abortion at age 16, speaking of both her pain, and her ultimate healing. She also spoke about both the legal and cultural landscape both at the time of her own abortion and now, and about the Catholic Church’s teaching about abortion. A difficult topic to speak on, and Victoria’s spoke with authenticity and grace. There were several points in Victoria’s talk that I think deserve serious reflection by everyone, regardless of their views on the moral and legal issues. Second, those who argue for the dignity of the human person must take a consistent view and protect the right to life at all stages. And that those who make those arguments must also be committed to providing the assistance necessary for women to bring their babies to term. Yesterday, Fr. Warren Sazama, pastor of St. Thomas More Church in St. Paul, preached about original sin. Taking his cue from the line in yesterday’s Gospel where John the Baptist instructs his disciples, “Behold the Lamb of God, who takes away the sin of the world,” Fr. Warren spoke about the evil we observe in the world as well as our capacity to participate in that evil. Indeed, the temptation to make choices contrary to the good can be quite strong at times. Like Fr. Warren, King reminded us that each of us possesses both evil as well as good. We like to think that we are the good guys and that evil is out there somewhere. Other folks are bad guys but they are not us. That creates a nice binary that is easy for us to accept; we can line up some people on one side of the line and put others on the other side – and, although we might not say it out loud this way, feel justified in loving the one side more than the other. Within the best of us, there is some evil, and within the worst of us, there is some good. When we come to see this, we take a different attitude toward individuals. The person who hates you most has some good in him; even the nation who hates you most has some good in it; even the race that hates you most has some good in it. And when you come to the point that you look in the face of every person and see deep down within what religion calls “the image of God,” you begin to love in spite of. No matter what the person does, you see God’s image there. We have the capacity for evil, yet we are created in God’s image. We need to recognize that tendency in ourselves, and not think we are somehow removed from the sin of the world. Equally importantly, we need to recognize that those we label the bad guys – those whose capacity for evil is sometimes easier to see – also have the capacity for good. Our challenge is in seeing the good in them, for they too are created in God’s image. Given my reaction to the book and what I have read of the experience of the actors in making it (see, e.g., here), I really wanted to love the film, but I didn’t. I am glad the film was made. There are few enough films that seriously explore questions of faith and of what it means to live a life devoted to God (in Christian terms, to Christ). So I am happy to see an addition to that genre and had been anxious to see what Scorsese would do with it, as it seemed like such a labor of love for him. It is not surprising to me that the film is not doing well in the box office. There is the initial limiting issue that I’m not sure who, beyond those (like me) who want to see it because they read the book and those who are interested in efforts to Christianize Asia or in evangelization more generally, will be drawn to choose this over some other movie. But the problem for many moviegoers is that there is a lot of talk and very little action – and the action that is in the film is very repetitive (as in, how many different ways can you torture someone). But, while I don’t have a problem with movies with a lot of talk (I actually tend to quite like them), this one did not move me as I had expected it would. Perhaps part of it was Andrew Garfield in the role of protagonist, who I did not find compelling. (I found myself wondering if I would have found the film more moving had the roles of the two Jesuits who set off for Japan been reversed and Adam Driver had played the main role.) Perhaps it is that the movie is too long, which may have contributed to the fact that it is not uniformly engaging. I suspect it is more that there is only so much of a character’s internal monologue (or third person novel narrator account of that) that can be captured in a film through narrated letters and allowing the audience to hear a character’s thoughts. That is true primarily of Garfield’s character Rodrigues, but is also true to a lesser extent of the priest Ferreira (played by Liam Neeson). That makes the film a less than fully effective way to capture the internal conflict of either character. It is true that the film succeeds in raising for consideration that same questions the book does, first and foremost: What does it mean to serve Christ? (Early on we hear Ignatius’ colloquy questions from Week One of his Spiritual Exercises: What have I done for Christ, What am I doing for Christ, What will I do for Christ? And there is no question the desire to serve Christ is what motivates Rodrigues.) And what does it mean to apostatize? But I don’t think it raises those questions as well or effectively as the book does. I think Endo’s work is one deserving of attention, but my bottom line is: If you really want to seriously reflect on the questions Silence raises, read the book if you have not done so, rather than going to see the movie. And I don’t mean to dissuade folks who have read the book from seeing the film. My sense is that there have been mixed reactions to it and I would love to hear from folks who liked it more than I did.